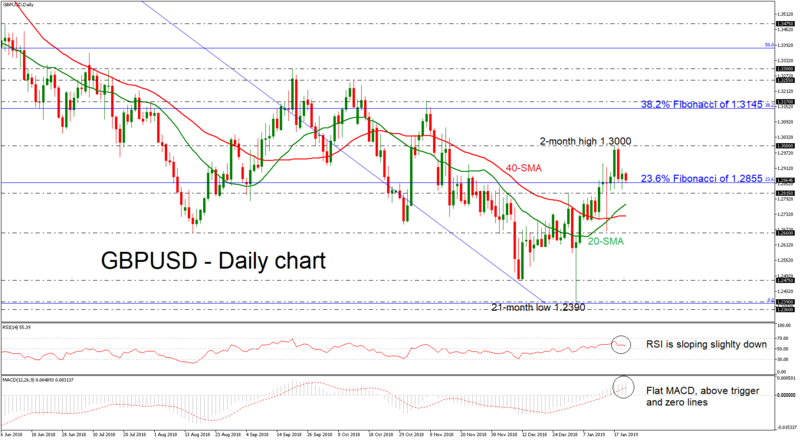 GBPUSD has found a strong resistance obstacle on the significant psychological level of the two-month high of 1.3000, reached on January 17. However, Cable has been trading within the 1.3000 and the 1.2855 zone over the last week, which is the 23.6% Fibonacci retracement level of the downleg from 1.4375 to 1.2390. The short-term bias looks neutral as the MACD keeps moving sideways in the positive area, while the RSI is pointing marginally down above the threshold of 50. It is worth mentioning that the 20-day simple moving average (SMA) surpassed the 40-day SMA, creating a bullish crossover, suggesting some gains. If the price slips back beneath the 23.6% Fibonacci and the 1.2815 support, this could open the door towards the 20- and 40-SMAs around 1.2770 and 1.2725 respectively at the time of writing. Moving lower, a violation of these levels would increase negative movement, hitting the 1.2660 support, registered on January 15, while a drop below this line would open the way towards the 1.2475 barrier. If investors turn their eyes even higher though, the pair could re-challenge the 38.2% Fibonacci mark of 1.3145, before pushing prices until the 1.3170 resistance. If bullish actions appear stronger, the market could find the next obstacle at the 1.3255 region, identified by the peak on October 12. Concluding, the near-term risks look to be turning neutral to negative after the pullback on 1.3000, while, in the long-term, the outlook would shift to bullish if the price action surpasses the 61.8% Fibonacci near 1.3600.